UK Headlines were made in 2015 when a study in the British Journal of Cancer was published claiming 1 in 2 women and 1 in 3 men will develop cancer at some point in their lives. Two years later on June 20, 2017, a report titled Canadian Cancer Statistics 2017 released by the Canadian Cancer Society stated for males, the lifetime cancer risk is 49% and for females it is 45%. Another study showing the dangers and ineffectiveness of chemotherapy has just been published and it has gone viral. The study titled Neoadjuvant chemotherapy induces breast cancer metastasis through a TMEM-mediated mechanism was published in the journal Science Translational Medicine describing how chemotherapy could allow cancer to spread, and trigger more aggressive tumors. By studying the process of intravasation, or entry of cells into the vasculature, the study’s authors discovered that chemotherapy, in addition to targeting tumor cells, can also increase intravasation. The authors found that chemotherapy increased groups of cells known as tumor microenvironment of metastasis (TMEM) which collectively usher tumor cells into the body’s vasculature. The study discovered that several types of chemotherapy can increase the amounts of TMEM complexes and circulating tumor cells in the bloodstream. Why is this important? The chances of survival dramatically decrease once cancer begins to metastasize through the bloodstream and effect other organs and systems. Is the recent study the only one painting chemotherapy as a dangerous treatment option? In 2016 a groundbreaking study was commissioned by Public Health England and published in the journal Lancet Oncology. The study represented the first time that national data has been gathered together and analyzed for 30-day mortality after chemotherapy. It found that a larger proportion of patients are actually dying after chemotherapy than in the clinical trials carried out by the drug companies. The death rate in the clinical trials of drug treatments for lung cancer was 0.8%, but in the present study the reality shows it is actually 3%. By now, many are beginning to understand that one of the problems with chemotherapy is that it doesn’t address the underlying cause(s) of cancer. 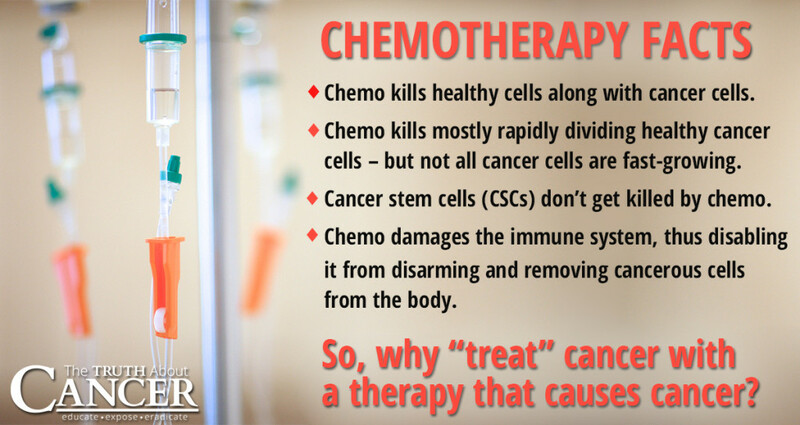 Chemotherapy originated from an idea and consciousness that was far from idealistic. The whole generation of chemotherapeutic drugs that are being used today, and there are over one hundred of them, developed from poisonous nerve gas created for warfare. As reported in 2012 by Green Med Info, cancer is the second leading cause of death in the developed world, and yet much of the medical and research communities are still in the dark ages when it comes to treating and understanding it. However, in the age of information, great strides are being made by doctors and researchers who are going against the grain of the failed convention ‘wisdom’ in cancer treatment. In addition, individuals are beginning to take responsibility by educating themselves. GreenMedInfo has been at the forefront with the world’s most widely referenced, evidence-based natural medical resource database containing over 30,000 abstracts and articles. Tagged cancer, chemo. Bookmark the permalink.